Are you ready to make huge transformations in your life & your relationships??? If so, then you're in the right place. Mindset & Breakup Coach, Founder of the Trooper Chick Lifestyle™, & host of the trooper chick podcast. I'm your long-distance BFF, your biggest supporter, and I'm here to help you get over your ex so you can move on and finally attract the REAL man you deserve! I've made it my mission to help you get everything you want in your future relationships by shifting your mindset & your beliefs into new ones that will serve you so much better! If you're tired of dealing with the same issues in your relationships, ready to get past the pain of your last relationship/breakup, and you're ready to make a change, I gotchu! Let's get started! Hey Chick! Sign up to receive the latest Trooper Chick news, tips, inspiration, transformational content, and a bunch of other fun stuff! Thank you for joining! Check your email for a confirmation message shortly. It's so good to have you! Are You Dealing With Heartbreak Hangovers??? Join the movement of amazingly strong women who've overcome difficult relationships and are ready to have better relationships in the future! Register for a course today to start maximizing your potential in your relationships. Click below to learn more about our available online classes. 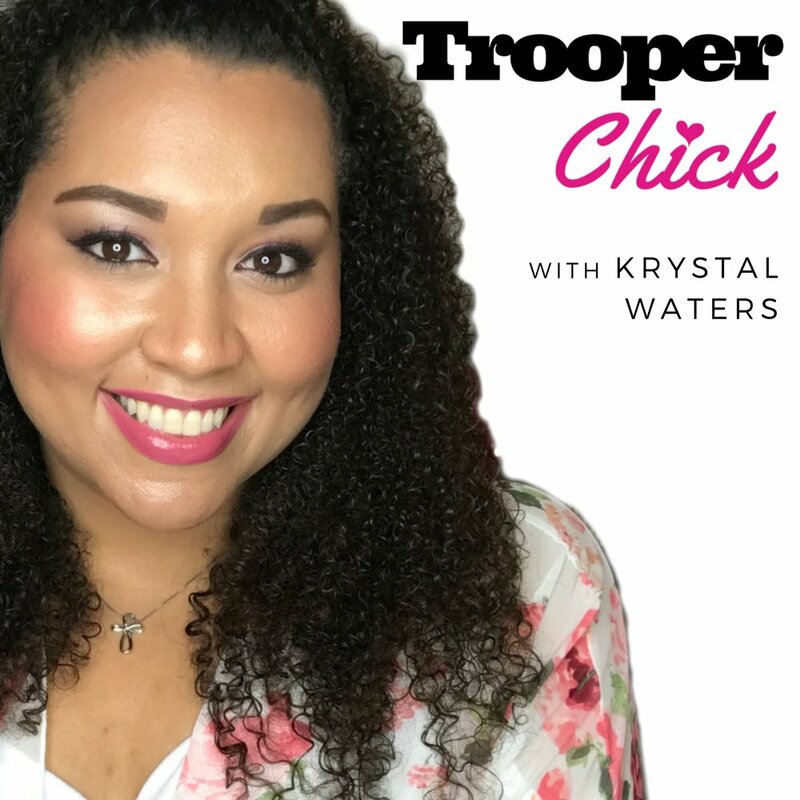 Subscribe to the Trooper Chick Podcast to get access to the newest episodes on how you can start getting over your ex & start living life like a true Trooper Chick! Testimonials from some amazing trooper chicks! I am so excited to have completed the course and evolve into this full-fledge TROOPER CHICK!!! After experiencing heartbreak, it devastated me and made it hard for me to see my worth and a future without someone I'd thought would never hurt me. I believe there was a point in time where I actually loved him more than I'd loved myself and TROOPER CHICK BOOTCAMP has helped me realize that that's not okay.We are worthy and we are TROOPER CHICKS! Krystal has given me guidance and has taught me to never put myself second to anyone or anything because if I can't love and respect me the way I'd like to be loved and respected, who will? This course has changed my life forever! After dealing with cheating in my relationship, I really felt like I wasn’t meant to be loved and I started falling into a really dark place in my life. I feel like Krystal really swooped in just in time to save me from being depressed and from giving up on being in relationships. I’m just super grateful and happy that I took this course and became a Trooper Chick!!!!! It was totally worth every penny because seriously…. my happiness and my confidence in myself has gone through the roof! That's something I can’t even put a price on. Ep. 12: Who’s Really WASTING YOUR TIME… Him? Or You?? Ep 11: Breakup EXCUSES... Does He Really Love You the Way You Love Him??? Ep 10: My Red Is Not Your Red... What Is Your PERSPECTIVE?? Ep 9: Why Men Don’t Approach You… Are You INTIMIDATING to Men?? Ep 8: STOP COMPARING YOURSELF & Just Live Your Life! Ep 7: He Stole My Money! DOUBT VS FEAR… Trust Your Gut. Ep 5: Can you really MAKE HIM LOVE YOU?? Ep 3: Mental Blocks, AFRAID to Get His Number, MAKE THE DECISION & GO GET WHAT YOU WANT! Learn how to move forward after a breakup with our FREE MAGAZINE: Heartbreak Hangover! Tell us where to send it, and you'll get it right away!